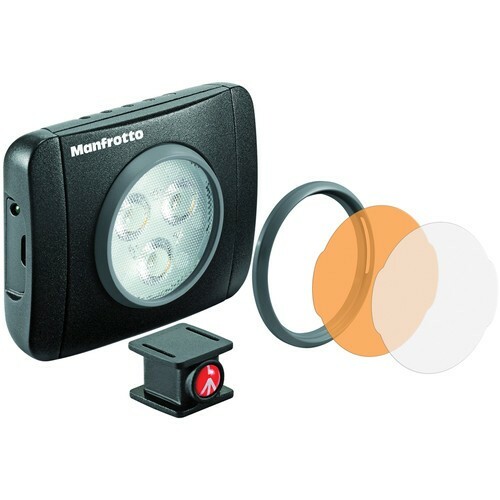 Packing 3 LED diodes, Manfrotto's black Lumimuse 3 On-Camera LED Light is bright while remaining compact enough to fit in a compact camera kit. Despite its size, the Lumie Play can fit itself into many shooting situations for both stills and video. To control the light output, 3-step dimming is available. To change the quality of the light output, a snap-on filter kit comprised of color temperature and diffusion filters is included. For more options, additional filters are available separately. 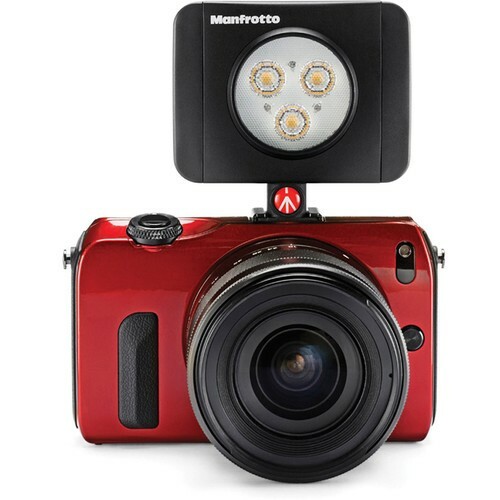 The Lumimuse 3 is powered by an internal rechargeable Lithium-Polymer battery for about 60 minutes of battery life and can be secured to your camera directly with the included shoe mount. Another option is to use the 1/4"-20 tapped hole on the shoe mount to position the light off-camera, either on a tripod or on another accessory like a magic arm.